Fifty years on, the full story of Expo 67 mania is finally ready to be told. 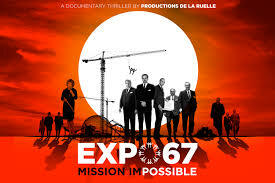 With incredible never-before-seen footage, Expo 67: Mission Impossible gives viewers the chance to relive Canada's landmark event in a whole new light. Travel back, take in the festivities and watch this transformative moment in Montreal's history when a whole new island was added to the city, 847 buildings were constructed, as well as three bridges, trains, an amusement park and more in just over 1,500 days. Go behind the scenes to see how this ambitious World's Fair was conceived and created—and barely finished in time. The film is screened as a partnership between the Winnipeg Architecture Foundation and FORTH. We are pleased to offer it as part of the Winnipeg Design Festival.